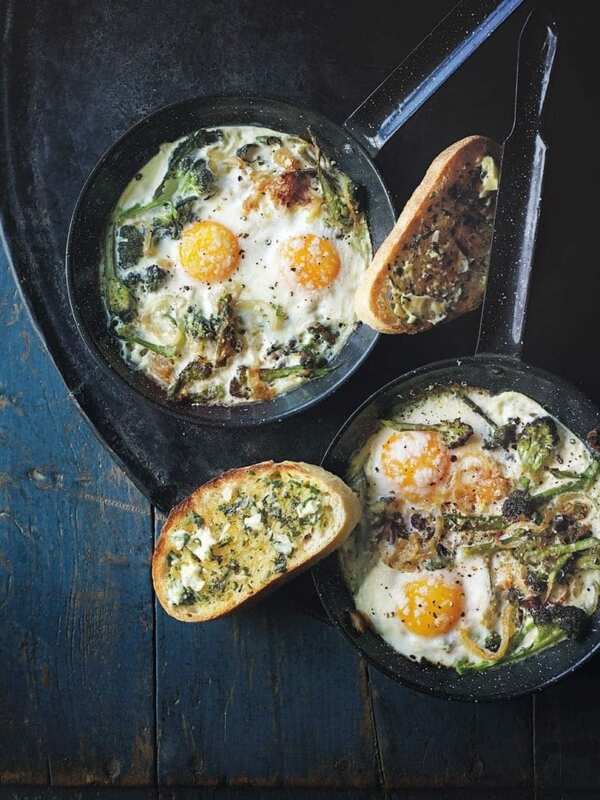 This baked egg recipe, with purple sprouting broccoli and parmesan, is best served with a thick slice of garlic butter toast. Heat the oven to 220°C/fan200°C/gas 7. Heat the olive oil in a large frying pan, then gently fry the onion for 5 minutes. Meanwhile, blanch the broccoli in salted boiling water for 3 minutes. Drain well, add to the pan, then turn up the heat and fry for 3-4 minutes, stirring, until slightly coloured. Stir in a grating of parmesan and season well. Divide the veg among 4 x 250ml ramekins or 4 x small pans. Crack the 2 eggs into each ramekin/pan and season. Divide the cream between the 4 ramekins/pans, then grate over more parmesan. Put the ramekins/pans on a baking tray and bake for 6-8 minutes until the whites are cooked. Serve the baked broccoli and parmesan eggs with slices of garlic butter toast, if you like.